This is a version of the famous “Radha Red” plum chutney that has been a favourite at many Hare Krishna multi-course feasts throughout Australia for decades. It features the subtle and exotic flavour of pure camphor, sometimes available at Chinese and Indian grocery stores. 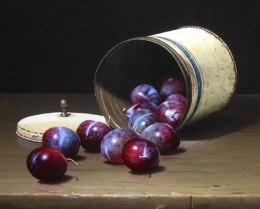 The plums should, if possible, be the Damson variety or the red plums referred to as a “blood plums”. Makes about 3 cups of chutney. 1/4 teaspoon powdered cardamom seeds. Heat the butter over low heat in heavy 5-litre/quart saucepan until it froths. Add the coriander, cardamom, and coconut, saute for one minute, and add the plums. Raise the heat and bring the chutney to a boil; then reduce the heat and simmer covered for about 15 minutes or until the plums lose their shape. Add the sugar and continue to simmer uncovered for another 40 – 45 minutes or until the chutney is fairly thick and glazed, stirring occasionally. Add the camphor crystals and mix well. Serve at room temperature or refrigerate covered for up to 4 days.